INDIE Award winner Robin Bullock’s 1993 solo debut Green Fields was one of the earliest albums to bring the guitar and cittern out front as lead voices in the traditional dance tunes of Ireland and Scotland. Even more remarkably, Robin multitracked all the instrumental parts himself in a musical and technical tour-de-force, establishing himself as one of Celtic music’s preeminent guitar and cittern masters. 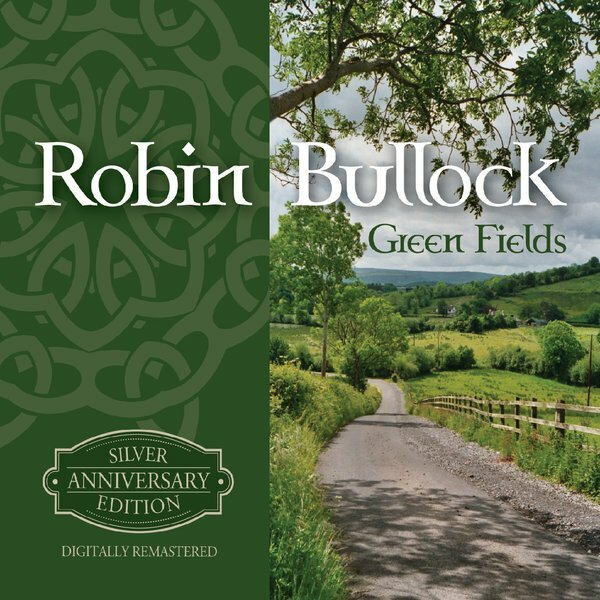 Out of print for many years, Green Fields now returns in a remastered Silver Anniversary Edition with dramatically improved sound quality and the original intended track sequence – a pioneering Celtic recording like you’ve never heard it before. At about the same time Irish musicians such as Johnny Moynihan, Dónal Lunny, Andy Irvine and Alec Finn, to name a few, began experimenting with the Greek bouzouki and discovered that its spiky, ringing tone was perfectly suited to either melody or accompaniment of the traditional dance tunes. This long-necked, bowl-backed cousin to the lute, mandolin and balalaika then began to evolve into a flat-backed, mandolin-like form, until the name bouzouki was no longer strictly applicable. Luthier Stefan Sobell (one of whose instruments I play on this recording) suggested the name cittern, which throughout the Renaissance and Baroque eras referred to a family of instruments with wire strings in pairs, played with a pick. The modern-day cittern is basically a large mandolin, usually with either eight or ten strings, which can be tuned a variety of ways. I play an eight-string version which I tune G-d-a-d’ or G-d-a-e’ (one octave below a mandolin). While the cittern and guitar are now accepted, and even necessary, elements in traditional Celtic music, they still tend to be considered backup instruments for the most part, and it’s rare indeed to hear them featured as lead voices for an entire album. On this recording, I’ve attempted to demonstrate the warmth and intimacy that these instruments are capable of bringing to the music, and perhaps contribute a few of my own ideas to the tradition as well. Three rousing Irish jigs to get things underway. I found the first in Cole’s 1000 Fiddle Tunes and the other two are well-loved session standards. Play this track loud. A haunting air composed by Scottish fiddler/guitarist/singer/songwriter Dougie MacLean. His own version is on his 1984 album Dougie MacLean Fiddle, a most impressive piece of work (and a major influence on this album). The first reel is another Irish session favorite, while the second came from my late friend Freyda Epstein, a fine singer and fiddler gone far too soon. Despite being an American tune as far as I know, it seems to fit right into this otherwise Irish set; it’s also known as “Crockett’s Hornpipe” and is sometimes attributed to Davy Crockett himself! The third reel comes from the late Sligo flute and whistle master Josie McDermott. A lovely waltz composed by one of my musical heroes, Scottish accordionist Phil Cunningham. Two of my own tunes in an arrangement featuring double-strung instruments exclusively. The first takes its title from a wonderfully bizarre book by Edward Gorey, the second from the name (at least in Baltimore) of a drink consisting of hard cider and beer. The first reel is found in both Cole’s 1000 Fiddle Tunes and O’Neill’s Music of Ireland, but I first heard it played by Norman Blake, who as far as I know has never gotten around to recording it. The second is in honor of my brother Dan, who like me loves a good ascending bass line, and the third was popularized by the Chieftains in the late 70s (and would show up again in 2003 on The Irish Girl, my duo CD with flute and whistle player extraordinaire Michel Sikiotakis). A composition by Ireland’s legendary blind harper Turlough O’Carolan (1670-1738), paired with one of mine that used to be called “Deborah Marie” but isn’t anymore. Two more harp tunes from the great Turlough O’Carolan, both plucked from the pages of Donal O’Sullivan’s definitive 1958 biography and tune collection Carolan: The Life, Times and Music of an Irish Harper. A traditional Irish reel from O’Neill’s with an irresistible title, coupled with one of mine with a title referring to my emotional state when I wrote it. Music and time are great healers. The title of this well-known and much-loved reel reflects the perennial Irish concern and fascination with “the new land.” I’ve slowed it down considerably here to bring out the bittersweet yearning in the melody (and perhaps also acknowledge the John Denver/Gordon Lightfoot influence on my early musical development). It so happened that the day I recorded this track was Inauguration Day of 1993, appropriately enough. America and the world have been through a lot since then… As I write these Silver Anniversary Edition notes in 2018, America’s future remains uncertain, and there are many possible directions it could go, both constructive and destructive. This, then, is dedicated to the hope that one day my country will live up to its ideals.